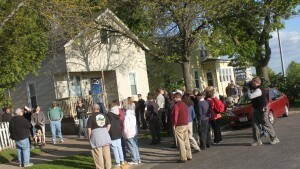 Livable Neighborhoods is a non-profit citizen’s advocacy group established in 1996. 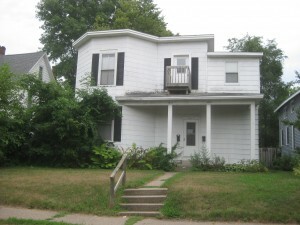 Our purpose is to improve and promote the livability of all neighborhoods in the La Crosse area. We encourage citizens to research and discuss important issues in our community, including the positions on those issues by candidates for elected offices. Livable Neighborhoods was one of the grassroots organizations to call for the binding referendum in 1998 in opposition to the proposed 5B-1 N-S Corridor through the marsh and our neighborhoods. The voters rejected the proposed 5B-1 by 11,951 to 7,076. We continue to support the City of La Crosse Comprehensive Plan, the neighborhood plans and the City Transportation Vision that do not include any calls for any new N-S road through the marsh or the neighborhoods. We prefer to see other improvements besides adding a new road or expanding existing roads, as well as changes to the current transportation paradigm where over 95% of the commuters 16 years of age and older rely on single occupant vehicles (SOVs) for their daily commutes. Our Board of Directors developed a Candidate Survey to help La Crosse residents learn more about the candidates for Mayor and Common Council. We have invited each candidate to complete our survey. The responses are being made available at www.livable-neighborhoods.org/2017-candidate-surveys/. Their answers will be posted as submitted without summary, editing or comment. Please be sure to vote on Tuesday, April 4th! Livable Neighborhoods, Inc., will host a Mayoral Candidate Forum, on Thursday, March 16th @ 7:00 PM, @ Black River Beach Neighborhood Center. The public is welcome to attend. At this time, the only candidate on the ballot is the incumbent, Mayor Tim Kabat; however we believe it remains important to hear from the candidate and ask questions about important issues. Our #1 issue remains the N-S Corridor (5B-1), a new 4 lane road between I-90 at US Hwy 53 and US Hwys 14/61 (South Ave) at 7th St S. The 5B-1 N-S Corridor remains enumerated in Wisconsin statutes all these years later, and still on the La Crosse Area Planning Commission (LAPC) and the Wisconsin Transportation Projects Commission (TPC) list of approved Transportation Improvement Projects (TIP) to begin in 2022. 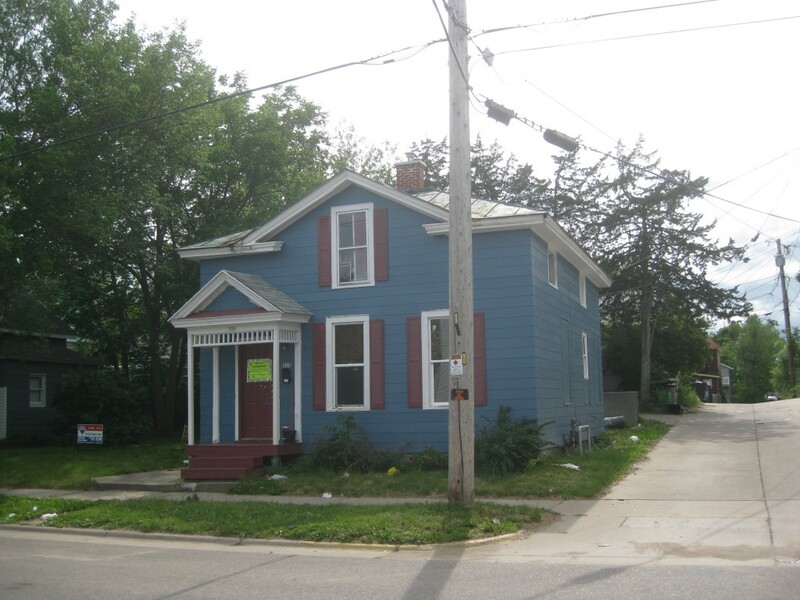 The recent Wisconsin Department of Transportation (WisDOT) Coulee Connections Study resulted in 6 build plans for a new road through the marsh and the neighborhoods that are hybrids of the original 5B-1 plan. 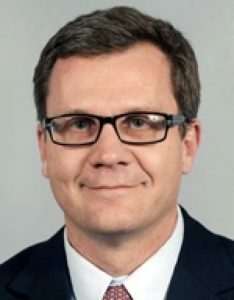 The current budget for this NS Corridor is $143.2 million, which according to the recent Legislative Audit Bureau Report is significantly lower than what the actual cost is likely to be because WisDOT systemically underestimates the costs of building new roads or expanding existing roads. Based on the Report, Livable Neighborhoods estimates the additional cost for this new 4 lane road that is all of 6.1 miles to be another $20+ million or $163.7+ million. And according to the Report, WisDOT also does not include the costs of the required environmental and social justice impact studies, which can be another $20+ million, or the costs of the required environmental and social justice impact remediation, which can add another $20+ million. This brings the likely costs of a new road to $203.2+ million or $40+ million per mile! It should also be understood that whenever WisDOT builds or expands a new highway, the municipalities must agree to maintain and repair that highway to WisDOT standards in perpetuity. WisDOT provides funds to the municipality for the maintenance and repair based on a fixed formula based on the population of the municipality and the lane miles of the road. Unfortunately, this formula often is inadequate, especially for urban highways like those in La Crosse. The State of Wisconsin also does not provide significant funding for the other municipal costs associated with providing services for a road, including traffic patrols, emergency response, court costs, planning, engineering, etc. – these majority of these costs are borne by the property taxpayers in that municipality. WisDOT has determined that the no build option (H) in and of itself will not be sufficient to address their projected traffic counts, and so plans to winnow down the 6 build options to 2-3 build options. In other words, WisDOT plans to build a new road. WisDOT is projected to being the next study phase in 2018 at a cost of $800,000. Our #2 issue is WisDOT’s original proposal to expand South Ave from 4 lanes to 5 lanes and take out a block of homes and some businesses, and make it more difficult for people to cross from one side to the other (in order to speed peak volume commuter traffic). This proposal has been modified, but the goal remains to move as many cars as fast as possible, especially at peak travel times, rather than find alternatives, such as a road diet that will slow the traffic down. And our #3 issue are WisDOT’s plans to widen State Hwy 16 from 4 lanes to 6 lanes County Highway OS to La Crosse St, and widen La Crosse St from 2 lanes to 4 lanes from Losey Blvd to 7th St. These expansions would increase speeds and traffic, making it more difficult for people to cross from one side to the other (in order to speed peak volume commuter traffic). Our preference is to fix the roads we already have first, and make them both safer and more accessible for all modes of travel, especially people that walk or bike. This means designs that slows vehicular traffic down, and improves the accessibility and safety for people that bike and walk. We are also expecting the City of La Crosse to begin to implement the proven Transportation Demand Management (TDM) standards that make up much of the no build option (H) that would negate the supposed need for any new or expanded roads. 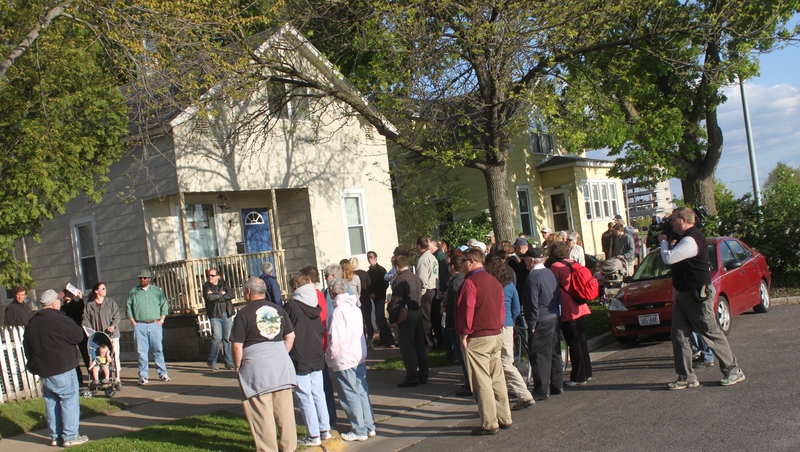 The La Crosse Community Foundation, Coulee Partners for Sustainability, Inc., Livable Neighborhoods and a gathering coalition of partners announce the Trees for the Coulee Region Campaign for 2015. The Campaign will raise funds to treat as many ash trees for emerald ash borer and to plant as many new trees as possible. 100% of the funds raised will be used for treatment of ash trees and planting new trees. Glen Jenkins, Chairperson of Coulee Partners for Sustainability said “We have a grant of $5,000 from the La Crosse Community Foundation to treat ash trees and that is a great start, but it will take a community wide effort to have a real impact on saving as many ash trees as possible”. Trees are important, even in an urban setting. Trees improve scenic beauty, increase property values, reduce air pollution, keep us cool in the summer heat, and help with storm water retention. The cost to treat ash trees properly for emerald ash borer with the injection method by a certified arborist is about $10 per diameter inch per year. It is the most effective treatment available, especially now that the infestation is virtually 100% in our area. The City of La Crosse alone has some 2,500 ash trees along the boulevards and sadly the infestation has already damaged many beyond the ability to be treated and saved. Ash trees are about 12% of the total urban forest in the city, so their loss will be huge. The ash trees that have not been treated are being removed now because it is safer and more cost effective to do so. Unfortunately, once the bug heavily damages an ash tree, it becomes a falling hazard more and there is no value in the logs. The City is doing what it can with limited resources to replace them, but the void in many areas is already noticeable. “We also want to plant as many new trees as possible where we’ve lost trees for whatever reason” said Charley Weeth, President of Livable Neighborhoods. “We especially want to do what we can in those neighborhoods where the need is greatest and are looking to partner with neighborhood associations and other groups to help with this campaign”. Ash trees with a yellow ring painted around the base are those that have been treated or will be treated this spring. They will be monitored and hopefully most will survive for many years to come. 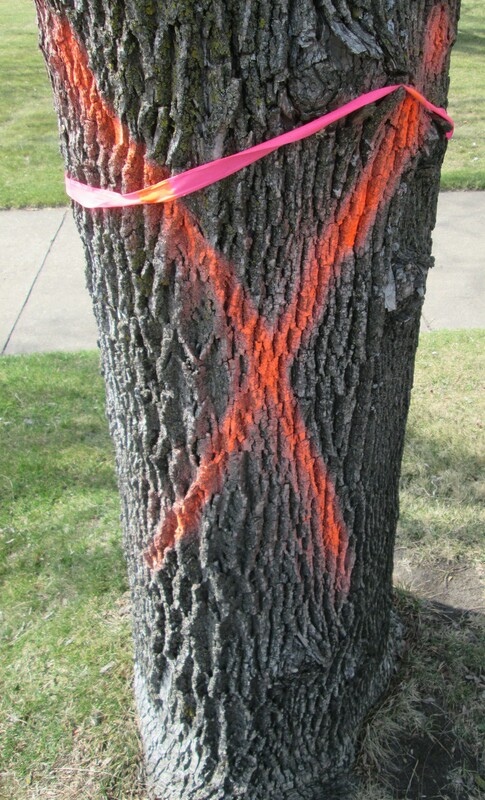 Ash trees with a red X in a circle and/or with a red ribbon will be removed. Stumps will be ground down later so new trees can be planted as soon as funds are available and at the right time of year. Most new trees are planted in the spring, while some can be planted in the fall. Property owners in the City of La Crosse are also encouraged to contract with a certified forester to treat the ash trees on the boulevards adjacent to their as well as on their properties, and to plant new trees too. Treatment must be established by specific deadlines based on the location. Residents in the villages and towns may also contact their respective local governments for more information. Neighborhood associations and other groups interested in the coalition are encouraged to contact us for more information. Coulee Partners for Sustainability, Inc.
A PayPal link is on the website www.cpslax.org. * Coulee Partners for Sustainability, Inc. is a Wisconsin not for profit corporation with IRS 501(c) 3 tax-exempt status. Contributions are tax deductible as provided by the tax code. Livable Neighborhoods will hold a Membership Meeting on Tuesday, July 16 @ 6PM at the Southside Community Center, 1300 6th St S., with guest speaker Mayor Tim Kabat. The agenda will be limited to updates on issues of interest including the status of the Coulee Connections study, the Neighborhood Revitalization Commission and the neighborhood associations, and a brief presentation on the Livable Neighborhoods review of available data from City Hall. We will then hear from our guest speaker, Mayor Tim Kabat, who will share his plans for improving the neighborhoods, followed by Q&A. Membership is encouraged but not required to attend and participate. The Tribune‘s Mayoral and Common Council candidate surveys and along with ours reveal a fundamental shift in the municipal election cycle: neighborhood revitalization is on everyone’s radar. It is a refreshing change and almost seems as if everyone’s made our “2020 Visions” white paper as their platform. It is also a major change from previous campaigns when every candidate talked about “bringing jobs to La Crosse” and “cutting property taxes” as if municipal governments have magic wands to really make these things happen. There is no magic wand to bringing jobs anywhere. Unless a community has some untapped natural resource or a hot new technology or service that has been developed by some local entrepreneur, there are really two choices to job growth: 1. Provide subsidies to try to steal jobs from someplace else (and hope you don’t go broke doing so before some other community does the same to you), or 2. Grow jobs locally, via an educated and trained workforce in a place with a great quality of life (Slow, but steady and less susceptible to theft by subsidy). There is also no magic wand to property taxes. Municipalities and schools in Wisconsin are locked into this regressive form of taxation that only works if a community can add tax base by expansion and/or redevelopment. A central city like La Crosse with our geography and boundary agreements is pretty much landlocked. Even if we were not, growth through annexation often adds more demand for services than the new, but spread out tax base can support. Our only real choices for both economic health and community vitality are a combination of revitalization and redevelopment, along with cooperation and collaboration with our neighboring communities. Residential property owners pay a higher percentage (53%) of property taxes than owners of commercial (37%), industrial (4%) and personal (6%) properties (See UW Extension report). This trend along with the fact we have more and more property that is tax exempt and surface parking lots means all property taxpayers are paying more and getting less. This combination puts even more pressure on our core neighborhoods and the schools, creating a downward spiral that is harder to reverse. The connection of neighborhoods and schools is also fundamental. If a neighborhood is distressed so there are fewer children to go to school, the district has to reduce programs or close schools. As schools close, that neighborhood is less attractive to families with children so single family owner occupied home ownership declines. This results in a more transient and less connected population, resulting in more blight and nuisances, which on turn lowers property values and reduces the tax base. Big redevelopment projects like the ones we’ve seen Downtown and at our major institutions are an important part of the equation, but they are not the whole solution. Unless the nearby neighborhoods also have both great schools and good quality housing to go along with these projects, too many of their people will choose to live outside of the city. This creates more urban sprawl and people that commute via Single Occupant Vehicles (SOVs), which creates more demand for roads and parking that gobbles up more of both our resources (police, EMS, repairs and maintenance) and tax base. Rinse and repeat every decade for and ….. well, here we are. This paradigm is unsustainable economically, socially and environmentally. Until we get really serious and revitalize our core neighborhoods so more families with elementary school age children will choose to buy homes here, we’ll just see more “drive through” and “commuter parking lot” neighborhoods with more blight and nuisances, resulting in an ever shrinking tax base. One of the easiest, least expensive and most beneficial things we can do as a community is also the top recommendation of the report by the Joint City-County Housing Task Force: Better Education and Enforcement of Existing Codes and Standards. 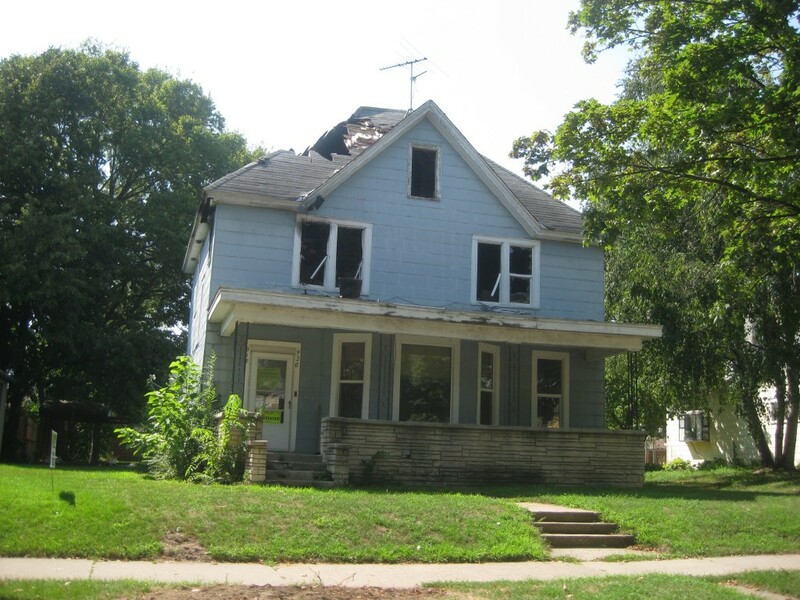 Blight and nuisance abatement is not as glamorous as big redevelopment projects, but it is absolutely essential to fully implement if we are to have any chance of revitalizing our neighborhoods. It is also essential to realize that we also must continue to revitalize our Downtown, which is a also neighborhood of its own, as well as work with business and industry in redevelopment. Neighborhood revitalization should not be in competition with businesses and institutions because we need both. No matter the results of the election, the candidates’ discussion about neighborhood revitalization bodes well for the city as a whole. Livable Neighborhoods has once again sent a survey to the City of La Crosse Mayoral and Council Candidates with a number of questions related to neighborhood issues. Here are the surveys as received without any changes or editing. We thank each candidate for their willing to serve and for answering our survey. Marianne Morton, Executive Director of Common Wealth Development in Madison has graciously agreed to come to La Crosse on Friday, October 5 at Noon @ the Southside Community Center, 1300 6th St S. She will give a short slide presentation, followed by Q&A. This is the 4th meeting hosted by Livable Neighborhoods to discuss the formation of a community development corporation in La Crosse. The impetus for these discussions were the Joint City-County of La Crosse Housing Task Force recommendations in their January 2012 report, including formation of a “Private Equity Group” to partner with private sources of capital to help improve our communities. Community development corporations (CDCs) are non-profit, volunteer organizations that typically access private capital and invest it into improving housing and neighborhood businesses. CDCs also organize community groups and invest sweat equity into community improvements. 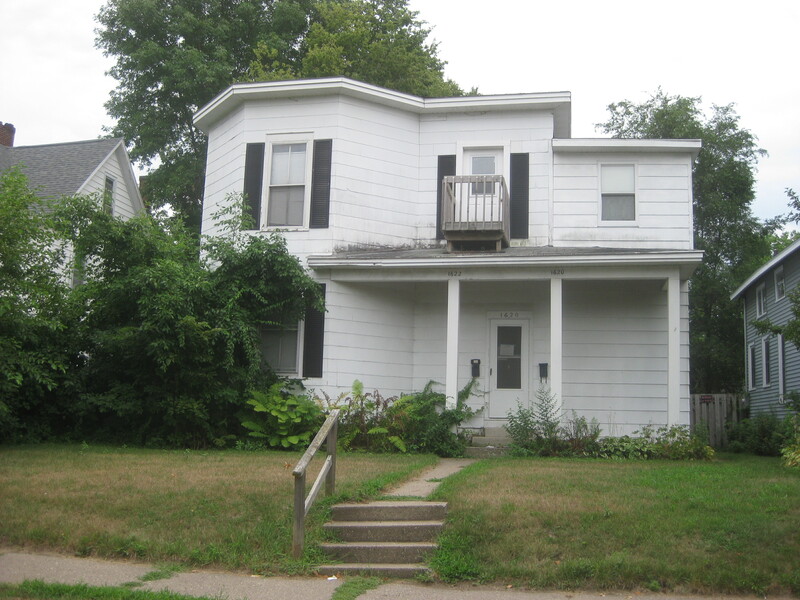 The Joint City-County of La Crosse Housing Task Force made a number of recommendations in their January 2012 report, including formation of a “Private Equity Group” to partner with private sources of capital to help improve our communities. This is the third organizational meeting hosted by Livable Neighborhoods. Organizational structure and an outline for a business plan are on the agenda for this meeting, as well as an assessment of opportunities and resources. The City has more distressed properties than ever before. This one has been condemned and unless a private developer is willing and able to step in and renovate or redevelop, it will sit vacant and then eventually be razed - meaning another expense for taxpayers as well as a loss of tax base. Brian Fukuda, La Crosse County Economic Development Specialist will give a brief overview on CDCs and the options in Wisconsin. This is the second organizational meeting hosted by Livable Neighborhoods. The first, held on June 3rd, the discussion focused on this presentation. The purpose is to discuss how best to make this recommendation a reality in 2012. Many communities have a Community Development Corporation (CDC) to advocate for and invest in improvements in housing and neighborhood businesses. This CDC(s) is in addition to Business Development Corporations (BDCs) such as LADCO in La Crosse that advocate for and invest in improvements in commercial and/or industrial properties. A CDC is typically a non-profit 501(c)3 tax exempt organization that educates the people on the importance of investing in our neighborhoods. A CDC can be as general or as specific in focus as the organizers determine is best for their community and is really only limited by the available resources to educate and invest. Please join us and share your visions and ideas on how best to fulfill this need in our community. If you know of someone that would be interested or have something to offer to this discussion, please share. Livable Neighborhoods is organizing a meeting for the purpose of discussing how best to make this recommendation a reality in 2012.